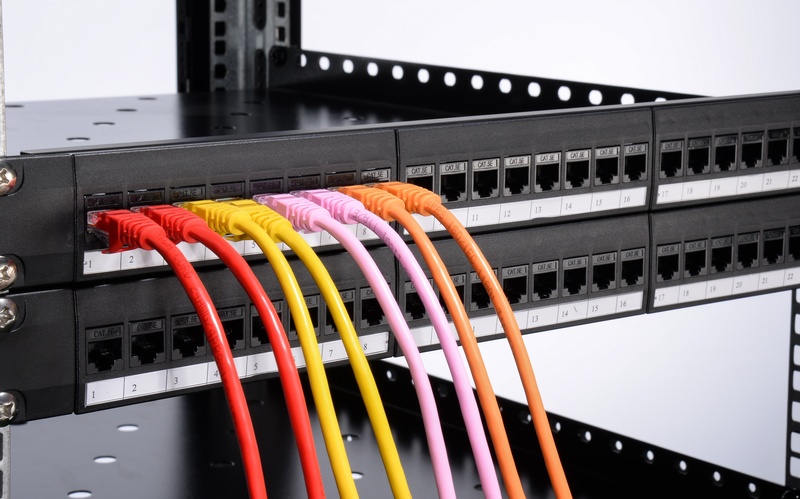 Bulk Ethernet cables, the network cable without connectors and boot covers, are popular among people as it is cost-effective and free of length limitation. One can customize the length of the cable and select RJ45 plugs and boot covers by themselves. 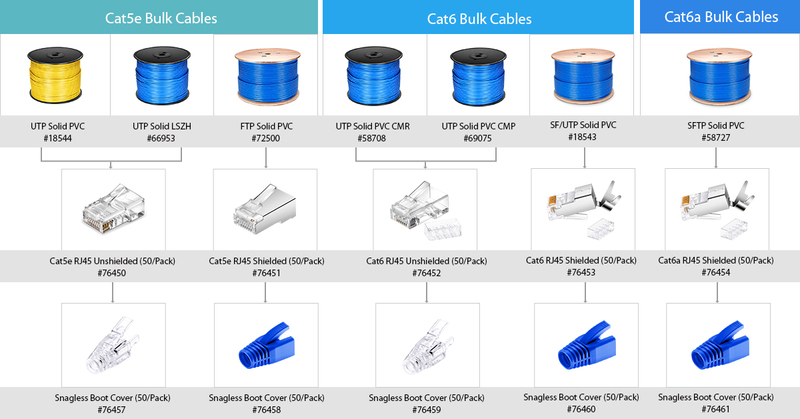 This tutorial spells out how to choose suitable boot cover and plug for Cat5e, Cat6, Cat6a bulk cable. What’s the Connector/Plug of Cat5e, Cat6, Cat6a Bulk Ethernet Cable? For different purpose, bulk Ethernet cables are matched with keystone jacks or connectors/plugs. If applied for the patch cable, connectors are needed in the installation as they can put conductors in the right order and prevent cables from falling off. Usually made of plastic, it is mainly deployed in connecting network interface card, hub, switch, wired phones and so on. 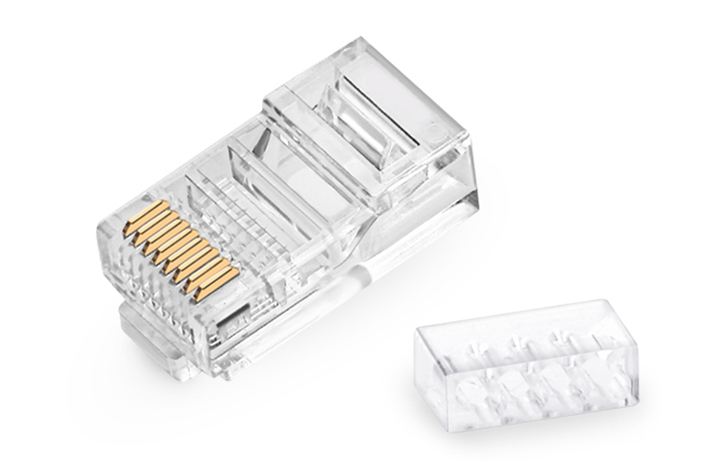 There are three types of connectors in the market, that is, RJ45, RJ11 and RJ12. This part will focus on how to choose RJ45 modular plug for Cat5e, Cat6, Cat6a bulk Ethernet cables. The first and foremost element to consider is the performance level. To effectively increase bandwidth speed, it is recommended to play Cat5e bulk cables with Cat5e plugs, Cat6 bulk cables with Cat6 RJ45 plugs, and cable Cat6a with Cat6a RJ45 plugs, say, match two components with the same performance level. Conductor gauge refers to the size of the conductor cross section. It goes oppositely from the diameter, as the larger the figure is, the thicker the conductor looks. When punch down bulk Ethernet cables, the eight conductors should cling to the 8 contacts in the standardized order and they should be identical in gauge size. 23 AWG, 24 AWG and 26 AWG are supported by FS RJ45 connectors/plugs. According to cable construction, the network cable can be classified into stranded cable and solid cable, which is correlated with the contacts in the plugs. The first contact shown in the picture has the contact prongs that straddle the conductor, suitable for both solid and stranded cables. The second one suits only the solid cable as the jagged end pierces jacket and embeds into the strands of the conductor. The third one adopted by FS is applicable to both solid and stranded cables. Its long contact prongs spread apart to accept the conductor, ensuring the connectivity and reliability. Shielded plugs are more expensive than unshielded ones, as shielded plugs have a metal outer shell and are often specified in areas where a shield or ground connection is required. Areas with high electrical noise use shielded cable and plugs. What Is the Boot Cover? Boot cover is a cable device that protects the connector from bulk cable snags while providing strain relief. It is slid over the RJ45 connector. 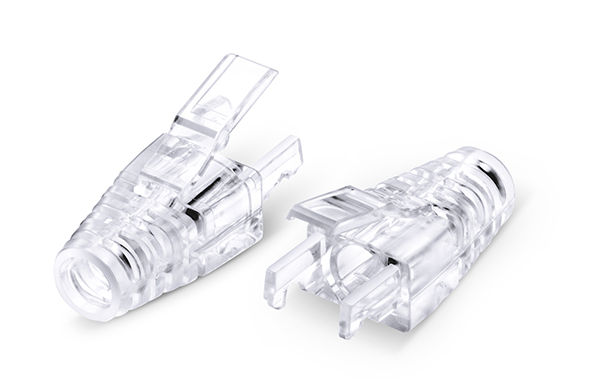 An advantage of an RJ45 strain relief boot cover is that it completely closes the connection between the connector and the connection. This means that dust can not be added and the chance of malfunctions is reduced. One should first make the boot on the cable and then attach the connector. When you do this in reverse order, the connector can not be put over it anymore. The diameter of the cover’s inner circle cannot be smaller than the cable diameter. Otherwise, the boot cover cannot be slid into the cable. FS provides different sizes of boot cover for bulk Ethernet cables: 5.8mm, 6mm, 6.5mm, 7mm and so on. Compared with solid cables which only contain one conductor, stranded cables that consists of several conductors woven together are more flexible. The boot covers for the two types of network cables are different. FS specifies them according to the cable construction for the customers. Shielded bulk cable has an additional shielding jacket around the conductors, so it is thicker than the unshielded one. You must make clear the type of your network cables before buying the boot cover, to avoid unnecessary cost waste caused by improper selection. FS provides boot covers designed specially for the shielded bulk cable. How does your network or server cabinet look like? Are they stocked with varied servers or networking equipment connected with long cables that reach out to the devices on the other cabinet or enclosure? This is exactly what we used to call point-to-point cabling. However, it is also an art to keep a neat cabling. This article unveils a compelling new cabling method—structured fiber cabling solutions for network&server cabinet. What Is Structured Cabling and How Does It Matter? In recent years it has become apparent that fiber-optics are replacing copper wire as an appropriate means of communication signal transmission. The standardized architecture and components for communications cabling formulated by the EIA/TIA TR42 committee—structured cabling is used as a voluntary standard by manufacturers to ensure fiber-optics interoperability. In a structured cabling system, a variety of patch panels and trunk cables are harnessed to create a structure that allows for hardware ports to be connected to a patch panel at the top of the server rack. 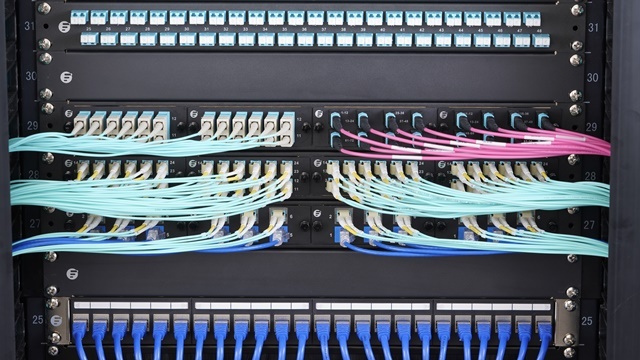 That patch panel is then connected to another patch panel via a trunk (multi-fiber assembly designed for use in conveyance) in the MDA (Main Distribution Area). When you have several servers, with multiple patch connections and power cords running through your server rack, you need to keep them arranged and managed with an excellent rack cable management system. Here some may wonder why bother to cost more on the connecting gadgets? Well, without running long patch cords from equipment racks, MACs are much quicker as the cable and port tracing becomes a much easier job. The potential for downtime goes down with the reduced potential for human error. A structured cabling system will look aesthetically pleasing. In the server room, there may be a server cabinet and a network cabinet for the storage of routers, patch panels, switches and a wide variety of networking equipment as well as networking accessories. Taking FS GR600-series server cabinet and GR800-series network & server cabinet housing 10G and 40G applications as an example, let’s see an exemplary structured fiber optic cabling. As for intra-rack cabling, say server rack to network rack (10G-40G), connect the 10Gbe switch to a MTP-8 MTP/MPO breakout cassette via a 10GBASE-SR SFP+ transceiver and an LC fiber optic patch cable. Then bridge the cassette with fiber adapter panel which is finally linked to the 40Gbe QSFP+ uplink port on a 10Gbe switch through the MTP trunk cable and a 40GBASE-SR4 QSFP+transceiver. In this respect, the centralized cabling solution keeps cables organized and out of critical airflow paths. When it comes to network rack to core rack (40G-40G), connect the 40Gbe QSFP+ uplink port on a 10Gbe switch to the FS ultra high density fiber adapter panel with 6 MTP adapters through the MTP trunk cable and a 40GBASE-SR4 QSFP+transceiver. Then draw together two same adapter panels together via an MTP trunk cable. Finally, link the second adapter with the 40Gbe switch by the 40GBase-SR4 QSFP+ MTP/MPO transceiver module and MTP trunk cable. In this way, you can save much energy on tracing each devices. To realize a structured fiber optic cabling for server cabinet, rack cable management is crucial. FS also provides FHD blanking fiber adapter plate, 1U metal horizontal lacer panel with 5 rotating and detachable plastic D-rings, 1U rack blank panel, colorful T type magnetic velcro cable tie and P type adhesive label paper sheets. Structured cabling systems use various product sets, like fiber optic trunks and fiber optic enclosures, to create an easy-identifying, good-looking, ordered cabling infrastructure. FS boast various tools positioned as structured cabling solution for network & server cabinet. Open networking possesses distinct interpretations in different fields. It gradually picked up steam when adopted in open network switching, attracting flocks of vendors to take a share from the giant and burgeoning market. What is open networking? This article facilitates us to have a close look at it. Open networking appeals to breaking the tight linkage between the hardware and software. Previously, network switches are sold with hardware and software together. That is to say, if users buy a Juniper EX or MX series network switches, they also buy JUNOS; if customers buy a Cisco Catalyst network switch, they have to buy Cisco IOS. With the advent of open networking, things vary greatly alongside the separation of proprietary hardware from its software. Ethernet switch now lives in a disaggregated world where these elements can be chosen from the most appropriate supplier. Not only hardware and software, but also technical support and accessories are traded respectively. How Does Open Networking Impact on Network Switch? Open network switching hardware was first adopted by tech giants such as Google and Facebook, followed by a slew of enterprises. Besides, Cisco is jumping on the bandwagon of disaggregation in data center networks. It will allow data center customers to run its Nexus operating system (NX-OS) on third-party switches and to use other network operating system on its Nexus switches. Having been backed by several hyperscale companies, open networking drives the network switch to develop in a decentralized way. How Can Network Users Benefit From Open Networking? Open network vs. closed network, flexibility wins. As it is stated elsewhere, open means choices and options. You can configure the devices with equipment, software and architecture designs from different vendors. And you can turn down the affiliated OSes that may be feature-rich for you, and refer to those satisfying your rigid demand. Open networking entitles you to the architectural freedom to deploy the best topology and protocols for your environment. This has also fostered innovation dramatically with technologies and practices, allows enterprises to move faster to capture opportunity in the market. With open networking, you can save budget on dealing with what breaks down rather than throwing away the malfunctioned network switch. That is to say, if open source hardware fails, then you can change it; if software can no longer satisfy your needs, then replace it with other open source software. For example, some people have encountered the issue that the switch whines loudly. In this case, you can decide to make changes only on the hardware. Targeted troubleshooting also saves time and energy. From the perspective of the vendor, they can jump out of the scenario where they work behind closed doors, and turn to seek common points while reserving difference from others. You want to survive in the market, you need to be open, inclusive and be compatible to the third parties gadgets. A closed system by definition prevents others from openly interfacing with your offer, thus stifling collaboration and increasing the time to market. 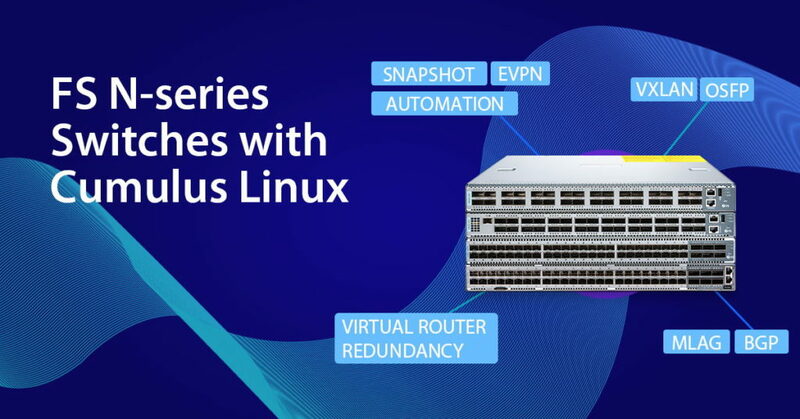 FS.COM not only released the open networking switch, but also recently sought cooperation with Cumulus Networks to add the leading open source operating system—Cumulus Linux to the FS N-series 40G and 100Gbe switches. This progress brings high-end features like automation to customers. Open networking represents the general trend. As vendors rush in swarms, customers can stay and wait to reap the benefits. Choose what suits your hardware needs from household names such as FS.COM. This freedom extends to every aspect of your purchase including cables and optics. 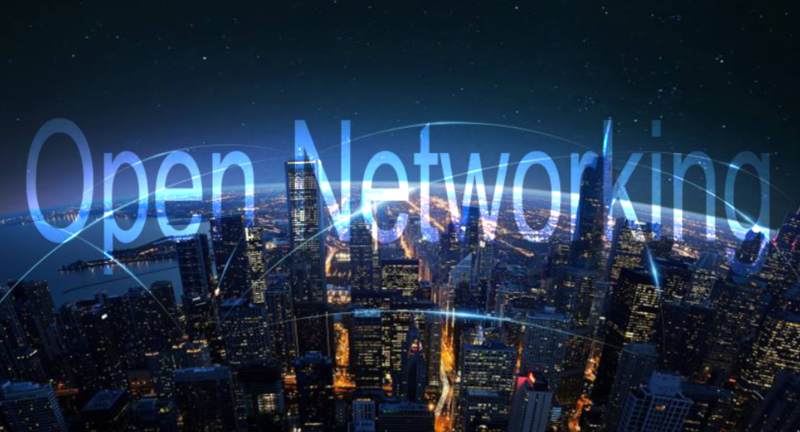 Posted in Enterprise Network	| Tagged open networking, open networking switch, open source software	| Comments Off on What Is Open Networking and How Does It Benefit Customers? What do you care most about a data center switch? The number of ports? The switch class? Or the operating system? Here is a comparison of two 48-port 10gbe switches from FS.COM and Cisco. Let’s see what the vendors value for their own devices. FS N5850-48S6Q network switch is initially positioned as the bare metal switch, but you can choose the one pre-installed with Broadcom ICOS or Cumulus Linux. 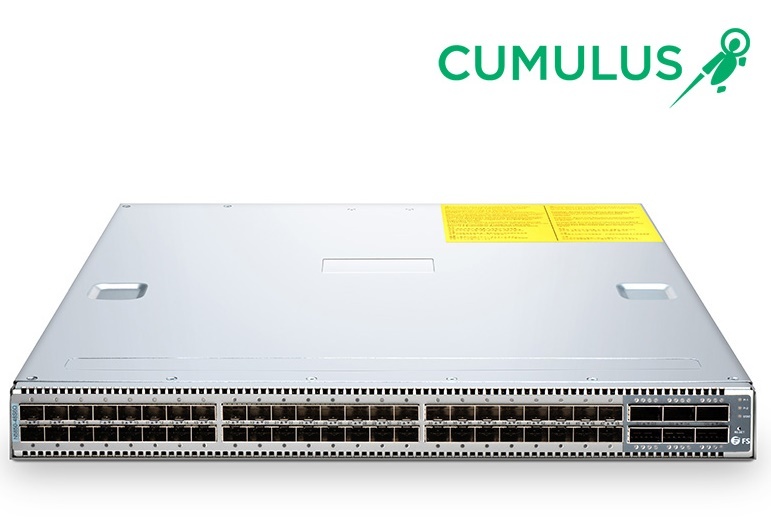 The combination of Cumulus Linux makes the N5850-48S6Q 10gbe switch stand head and shoulders above its counterparts. Here we revolve around the one with Cumulus Linux. FS N5850-48S6Q network switch comes with 48 SFP+ 10Gb ports and 6 QSFP+ 40Gb ports, and each 40Gb port can operate in native 40-Gbps or 4 x 10-Gbps mode. N5850-48S6Q is a top-of-rack (TOR) or leaf 10Gbe switch in a compact 1U form factor, ideally suited for high performance and programmable data center environments. It performs excellent low latency and power efficiency in a PHY less design while providing high-reliability features such as redundant and hot-swappable power supplies and fans in forward and reverse airflow configurations. The switch supports advanced features such as MLAG, VxLAN, SFLOW, SNMP, MPLS etc, making it ideal for traditional or fully virtualized data centers. The Cisco Nexus 3172PQ switch is a dense, high-performance 10gbe and 40 Gigabit Ethernet switch. Externally, it shares the same port configuration and 1RU form factor with FS N5850-48S6Q 48-port switch. Internally, it runs the industry-leading Cisco NX—OS software operating system, providing customers with comprehensive features and functions that are widely deployed. It supports both forward and reverse (port side exhaust and port side intake) airflow schemes with AC and DC power inputs. Dual redundant power supplies make it possible for the switch to run with a single power supply and with one failed fan module. The switch also has a serial console port, a USB port, and an out-of-band 10/100/1000-Mbps Ethernet management port. FS switches, generally, have the switching ports on the front panel. Oppositely, Cisco Nexus 3172PQ switch ports are at the rear side. As for the central processing unit (CPU), FS N5850-48S6Q boasts four cores and more cores will make your processor faster overall. The switching capacity is often a measure of the switch’s fabric bandwidth and the switch’s packets per second forwarding capacity and FS 1.44Tbps and Cisco 1.4 Tbps are about the same. The table shows a sharp difference in the cost, you can save more on the FS N5850-48S6Q and invest on cabling or other devices. The operating system acts as an interface between the hardware and the programs requesting I/O. Cisco Nexus 3172PQ 48-port switch are shipped with Cisco NX—OS network OS. You will have an operating system based on Linux, however, you interact with a management layer that hides Linux and the guts of the system from you. It is hard to make some changes. Cumulus Linux on the other hand isn’t based on Linux, it is Linux. It was not long ago that Cisco proposed the segregation of hardware and software. The technology may not be full-fledged. Cumulus Linux is the only solution that allows you to affordably build and efficiently operate your network like the world’s largest data center operators, unlocking vertical network stacks. At present, FS N5850 10gbe switch and Cisco 3172PQ are endowed with automation brought by Cumulus Linux and Cisco NX—OS respectively. Automation can replace the laborious manual workflows in configuration changes and upgrades, and also troubleshooting. One facet worthy of mentioning is that Cumulus Linux can seamlessly be applied to varied hardware, which outweighs Cisco NX—OS that is specialized. 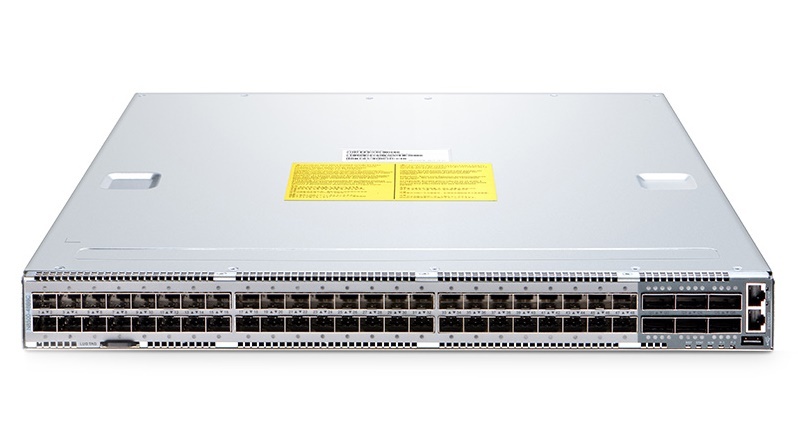 FS N5850-48S6Q 48-port 10gbe switch supports Ethernet VPN (EVPN) that enables you to connect dispersed customer sites using a Layer 2 virtual bridge, Virtual routing, forwarding (VRF), and Lightweight Network Virtualization (LNV) for deploying VXLANs without a central controller on bare metal switches. Complete Layer 3 unicast and multicast routing protocol suites are supported by Cisco Nexus 3172PQ 10gbe switch, including Enhanced Interior Gateway Routing Protocol (EIGRP) used on a computer network for automating routing decisions and configuration, Routing Information Protocol Version 2 (RIPv2), and Protocol-Independent Multicast sparse mode (PIM-SM). Cisco Nexus 3172PQ and FS N5850-48S6Q are both 48-port 10gbe switch suited for data center with robust performance and outstanding configuration. N5850-48S6Q network switch is entitled with three different forms for customers. Bare metal switch, bare metal switch with Broadcom ICOS or Cumulus Linux. That’s the great flexibility FS.COM provides with clients. The network switch has now grown in the same way that the server was developed in the market. Proprietary switches are now challenged by the white box switches that bring open source software. There are many network operation systems that can be accessed through ONIE for bare metal switches. Among them, Cumulus Linux is the most popular one. How does it develop and why does it stand out from the rest? Cumulus linux is a version of the open source operating system built to run on bare-metal switch hardware. Cumulus Linux is a software distribution that runs on top of industry standard networking hardware. Linux has a very full-featured networking stack and the mature linux operating system has already been in use for implementation of technologies from most networking vendors prior to incorporating it into their proprietary platforms. Sysadmins have access to and get familiar with a huge variety of tools for managing and operating linux platforms. It is said that 34% of the Fortune 50 have already adopted Cumulus linux. Then why Cumulus linux is popular among white box switches? Over the years, consumers have bought proprietary network switches from well-known vendors who installed their operating system on the original hardware. Now with the advent of white box switches, customers have found a more flexible approach to create their own switches. They can get hardware directly from the ODM at a discounted rate compared to similar switches from traditional networking vendors, because there are no network operating system installed in it. Vendors like Cumulus Networks and Big Switch Networks offer operating systems that can run on a variety of hardware switching platforms. These platforms can be installed into multiple bare metal hardware that come from different suppliers. The white box switch which enables people to purchase hardware and software independently is gaining popularity. It excels traditional switches in cost and the flexibility. Cumulus linux gives programmers and developers the ability to customize the platform to their needs. Built for automation, scalability and flexibility, Cumulus Linux is the world’s most flexible open network operating system for bare metal switches which allow you to build a data center network that ideally suits your business needs. Cumulus Linux Provides Economical Scalability. Since Cumulus Linux is Linux, all applications available with a Linux operating system are also available with Cumulus Linux. With off the rack hardware and a standardized linux stack, people can increase efficiency in operation by reducing production time. Both CapEx and OpEx can be lowered. Cumulus Linux Is Built for the Automation Age. Cumulus linux is a powerful, networking-focused linux based free operating system that offers a complete open architecture and is designed for easy automation. With automation, all of your configurations are stored in one place. No longer need to log into a dozen switches and start typing to make changes on multiple switches. Using automation, you can accomplish the change in one centralized repository and push them out to your switches with the flip of a switch. Cumulus Linux Provides Choice and Flexibility. Cumulus Linux currently runs on 50+ hardware platforms from 9 different vendors, and boasts two different types of silicon. It greatly increases the choices of hardware and avoids any potential hardware lock in or supply chain issues. Build your network based on your needs and you budget, and pivot easily as the industry changes. Providing economical scalability and choice flexibility, Cumulus Linux, the leading network operating system, greatly boosts the adoption of white box switch. Unless you try Cumulus Linux, you can never taste its charming. Related Article:Why Should You Use Cumulus Linux OS? Posted in Enterprise Network	| Tagged bare metal switch, cumulus linux, linux operating system, network operating system	| Comments Off on Why Cumulus Linux Is Popular Among White Box Switches? ONIE: Why It Is Special for Bare Metal Switch? Have you ever wondered that one day you could customize switches like the way you configure your own PC? It is actually happening. As vendors researches and develops switch structures by decoupling software from hardware, bare metal switch come into being. The switching technology can be programmed like Cumulus Linux servers. They may appear in a lot more average enterprises in the next few years with ONIE moving into the spotlight. Bare metal switch, also known as white-box switch, is solely a switch box with a chip inside it. 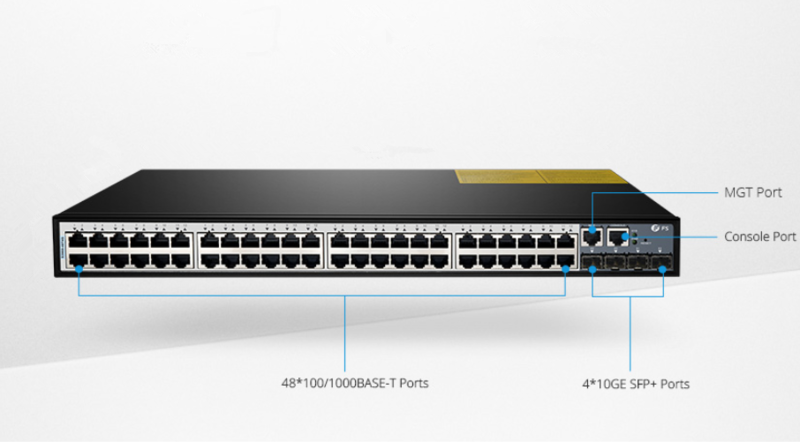 What makes it differ from original network switch? Well, common Ethernet switches, also called closed switches, are sold with hardware and software together. That is to say, if you buy a Juniper EX or MX series network switches, you also buy JUNOS; if you buy a Cisco Catalyst network switch, you have to buy Cisco IOS. This is in contrast to bare metal switches which widen the choice available to network buyers. They can choose components like application, network OS, and driver, depending on their own needs. The segregation of hardware and software fulfills the vision of a more affordable, manageable network and saves the time and funding for more projects, which is really beneficial to business. With a cheap bare metal switch in hand, what about the network operating system? That’s what ONIE (Open Network Install Environment) can do for bare metal switch. Introduced by Cumulus Networks, open network install environment (ONIE) combines a boot loader and a small linux operating system. Having been pre-installed on bare metal switches where software and bare-metal hardware are sold separately, customers can freely choose network OS from a range of sources over a network using IPv4, IPv6 and TFTP, or even locally from a USB flash drive. ONIE enables switch hardware suppliers to manage their operations based on a small number of hardware SKUs, enabling a thriving ecosystem of both network hardware and network OS alternatives. With ONIE, consumers can run any compatible network OS, such as cumulus linux Pica8, and Open Source on the bare metal switch, which dramatically reduces the overall capital and operating cost and breaking through the proprietary traditional network architectures. Moreover, switch & network OS vendors can concentrate on researching and developing switches and operating systems, without being distracted by the minutiae of loading a network OS onto a specific switching platform. As a component of the open hardware switch platform, ONIE will contribute to advancing standards that define the hardware/software interface. It has now been pre-installed on many bare metal switches, such as FS N8500-48B6C 100gbe switch which also supports current and future network requirements, including an x86- based control plane COM-E with BMC and Timing options for easier integration of automation tools familiar to server administrators. The increasingly mature bare metal switch will in return spur the ONIE to open its arm to more excellent network OS. Bare metal switch indeed makes our choice flexible and diversified. Moreover, ONIE, presenting an open standards platform for network operating systems, will facilitate the widespread adoption of bare metal switches by making it much easier for administrators to purchase and deploy standards-based network hardware in the same way that x86 servers accept a variety of conventional operating systems. Posted in Enterprise Network	| Tagged bare metal hardware, bare metal switch, cumulus linux, linux server, ONIE	| Comments Off on ONIE: Why It Is Special for Bare Metal Switch? Lots of customers have found the letters “CM”, “CMR” and CMP” in the product description when purchasing copper cables like Cat5e cable and Cat6 cable. These terms are the most common cable jacket ratings specified by the National Electric Code (NEC). CM rated cables that are designed for general use won’t be covered in this article. Let’s see the difference between CMR vs. CMP in their applications. CMR cable stands for “Communications Multipurpose Cable, Riser”. It is also referred to as “riser-rated cable” and designed to prevent fires from spreading between floors through risers or vertical shafts, that is to say, it can self-extinguish when ignited. As for flame-resistance, it does better than the CM cable, so CMR cable can be used where CM cable would be required. Consequently, CMR cable is more expensive than CM cable. CMP cable stands for “Communications Multipurpose Cable, Plenum”, which is the so-called plenum cable. It is constructed to limit the amount of smoke emitted in case of a fire and prevent flame from spreading to more than five feet. In some places where air travels throughout a building via plenum spaces, it is critical that Ethernet cable is made of the material that doesn’t give off toxic fumes if burned. CMP cable is the one suitable for installation into air plenum spaces. When it comes to the difference between CMR vs. CMP, as the flammability requirements for CMP cables are stricter than CMR cables, plenum cables can always replace riser cables, but not the reverse. Plenum rated cable is always twice as expensive as riser cable. Even though we have read lots of materials telling what is CMR vs. CMP, the knowledge about when to use these cables truly matters for the mass people. Only being applied to the practice, can the theory be tasted. Let’s see the following illustration. In the picture, the CMP plenum cables run horizontally in the structured ceiling and the dropped ceiling or under a raised floor where is typically considered plenum. 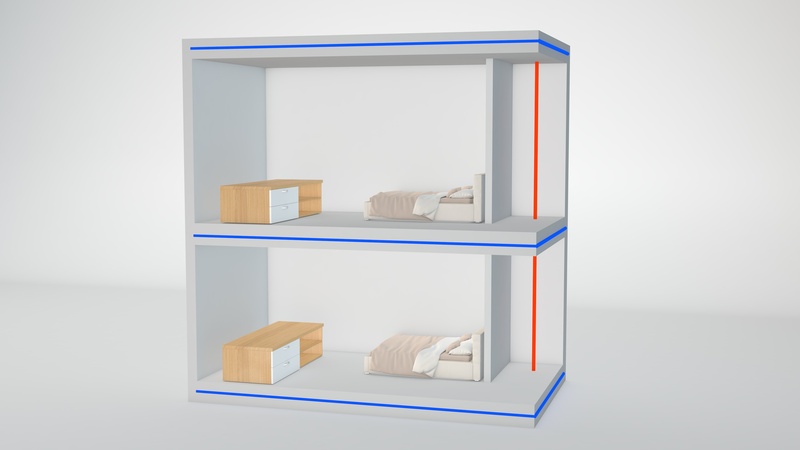 This is largely due to the fact that this place is full of fast-moving air as it facilitates air circulation for heating and conditioning systems. The presence of fresh air can bring dander of rapid flame spreading or dangerous gases distribution, thus causing damage to the furniture and threatening people’s lives. Therefore, CMP must be used in air ducts or vents. Typically, it is the prime choice for cabling construction in train station, airport and other public people-intensive places where we must prevent hazards to human health and safety from wiring. CMR riser cable runs between floors in non-plenum areas as the red line indicates. They are usually run vertically from the basement to the upper floor, so long as the cable does not need to run through an air duct. CMP, CMR and the like are the NEC’s ratings for the cable jacket. Different types of copper cables like Cat5, Cat5e and Cat6 cables all have CM, CMR, CMP versions. They have the same exact copper inside. The difference is the outer casing or “jacket” that surrounds a cable’s internal wiring and insulation. This article covers what is riser cable and plenum cable, when to use plenum cable and riser cable. Choosing the right CMR vs. CMP cable is really important. It not only helps prevent dangers but also avoid unnecessary interference by local authorities if you fail to meet the fire codes. If there are any problem or puzzle during cables selecting or application, FS excellent tech team and sales team would like to offer help. As the data center expands, the traditional fiber optic cables can hardly meet the high requirements for networking, as they not only occupy a large room, but also make it more difficult to manage cables. 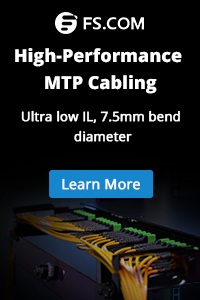 In contrast, MTP cable and MPO cable provide a multi-fiber connectivity in one connector to support higher bandwidth and higher density applications, thus becoming popular. Generally, MTP/MPO cables are classified into three types: trunk cable, harness cable and conversion cable. See what they are and their applications. MTP/MPO trunk cable is a cable with two MPO or MTP connectors at both ends, with nothing different from ordinary patch cables seen from outside. However, the truth is that the cable usually accommodates 12, 24, 48 and even 72 fibers, and the ends are terminated with 12-fiber or 24-fiber MTP/MPO connectors according to customer’s choice. FS MTP/MPO trunk cables are designed for high density application which offers excellent benefits in terms on site installation time and space saving. They are available in multiple lengths and in single mode, multimode OM1, OM2, OM3 or OM4 with LSZH or PVC Jackets. With BIF, FS MTP and MPO cables are designed for improved bend performance in reduced-radius applications such as residential or office environments which have less bend sensitivity. MTP/MPO harness cable is also known as fanout cable or breakout cable as it has a single MTP connector on one end and on the other end it breaks out into 6 or 12 connectors (LC, SC, ST, etc.). 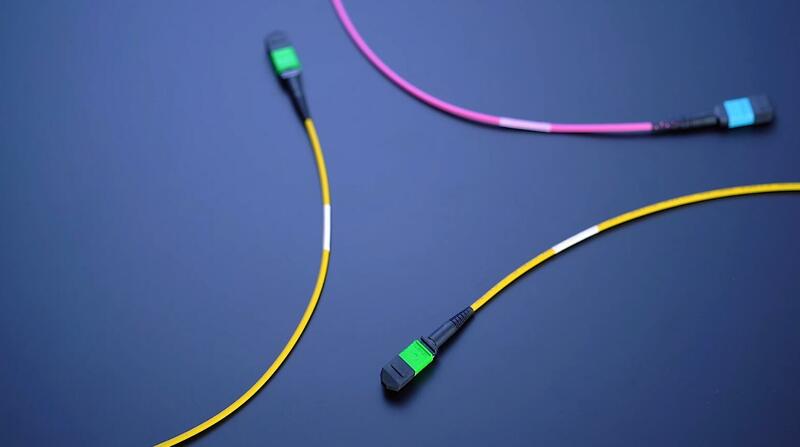 As one fiber patch cord contains two fibers for receiving and transmitting, a 8-fiber MTP-LC harness cable, for example, has 4 LC connectors and a MTP connector at either end. 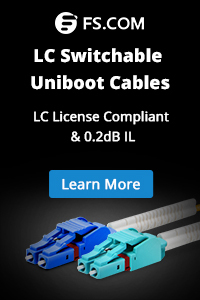 Similarly, a 12-fiber MTP-LC harness cable has 6 LC connectors and a MTP connector. MTP/MPO harness cable is usually deployed for 40G to 10G transmission and 100G to 25G transmission. MTP/MPO conversion cable has the same fanout design like the MTP/MPO harness cable, but it is terminated with MTP/MPO connectors on both ends. However, the MTP connectors on each end are different in fiber counts and types, which can provide more possibilities for the existing 24-fiber cabling system. It eliminates the wasted fiber, and therefore can largely increase the capacity of the existing 12-fiber and 24-fiber MTP network. How to Deploy MTP/MPO Cables in 10G/40G/100G Connections? Follow with the MTP/MPO fiber cables are the MTP/MPO cassettes, MTP/MPO fiber adapter panels and MTP/MPO breakout panels. 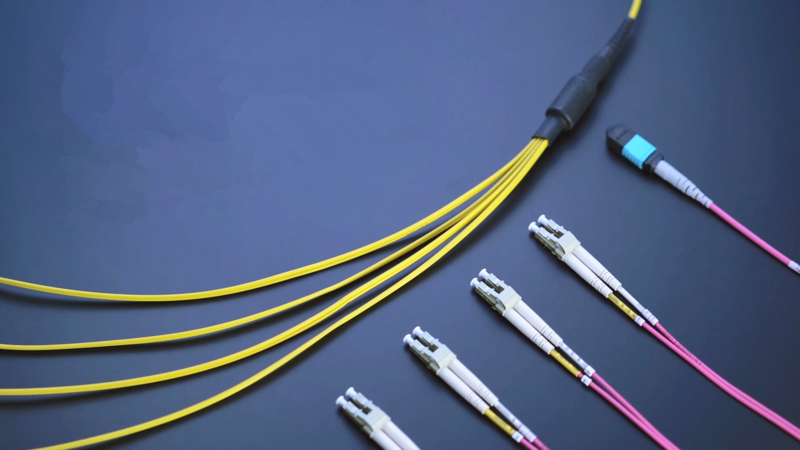 Here are some typical applications of MTP/MPO fiber cables in 10G, 40G and 100G connections. In the following two scenarios, two MTP/MPO cassettes installed in the fiber enclosures are connected by MTP/MPO trunk cables, making the core of the cabling simpler. The front panel of the cassettes is connected upwards to server and downwards to 10G ports of FS S5800-48F4S via OM4 fiber optic cable and 10G transceiver. In this scenario, a 40G QSFP+ port on the FS S5850 48S6Q switch is split up into 4 10G channels. A 8-fiber MTP-LC harness cable connect the 40G side with its MTP connector and the four LC connectors link with the 10G side. As shown below, a 12-fiber MTP trunk cable is used to connect two 40G optical transceivers to realize the 40G to 40G connection between the two switches. The connection method can also be applied to 100G-100G connection. In this figure, a MTP/MPO conversion cable connects a CXP 120G SR12 and three 40G QSFP+ SR4 fiber optic transceiver modules to realize the migration from 120G to 40G networking. High performance, high density MTP cable and MPO cable solutions can swap up to 12 traditional fiber connectors with one single small form factor connector, reducing installation time and labor costs. They are suitable for a variety of applications including data centers, telecommunications, broadcast communication, and server rooms. FS strives to provide you with best products with reasonable price and best service. Type A MTP Cassette and Type B MTP Cassette: When and Where to Use? As switch stacking, the premium feature of few network switches, evolves as a core competence of Ethernet switches in the market, vendors strives to release varies stackable switches and produce switch stacking tutorials for customers. 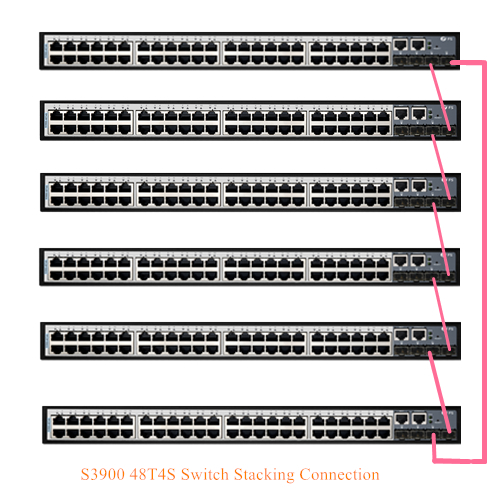 This post will take FS S3900-48T4S 48-port stackable switch as an example to explore how to stack switches together. S3900 48T4S 48-port gigabit switch comes with 48 downlink RJ45 ports that are triple speed copper ports connecting with end-devices and four 10Gbps SFP+ uplink ports that connect toward the core of the network. With 176Gbps switching capacity. This network switch delivers wire-speed switching performance on all Gigabit ports which support auto-negotiation for port speed and duplex mode. The 4 built-in 10G SFP+ ports provide uplink flexibility, allowing the insertion of fiber or copper, Gigabit or 10G transceivers. These 10Gbps SFP+ port can work as both uplinks and stacking links to servers or service provider, corporate, or campus networks, reducing bottlenecks and increasing the performance of the access network. The dual power supply can ensure the effectiveness of mission-critical network. If one power supply fails for some reason, the other one will take over seamlessly to sustain the normal running of network. Moreover, the design of the S3900 48-port stackable switches incorporates high energy efficiency in order to reduce the impact on the environment. The fan is smart controlled by the traffic. When the switch runs busy, the fan inevitably generates much noise which, however, won’t cause distress. The Green Ethernet power-saving features can be translated into that, on an inactive link, the port moves into inactive mode and saves power while keeping the administrative status of the port up. How to Stack 48-Port Gigabit Switch? The S3900 48T4S 48-port network switch can allow up to six switch being stacked together, in which it excels S3800 series switches. Use DAC, AOC or transceiver modules plus fiber optic cable can simply join the switches together. Only the rightmost two SFP+ ports on the switch can be used to stack, and should be cross linked, as shown in the following video about 24-port S3900 switch stacking. How to Manage Switch Stacks Effectively? Managing switch stacks is also not an easy work because there is a set of network switches in one stack unit. As for the S3900-48T4S stackable switch, an industry-standard command-line interface (CLI), accessed through the console port or Telnet*, provides a familiar web user interface and command set for users to manage the switch. Moreover, just one command and a reboot* can realize switch stacking, more convenient than common switch stacking. An embedded user-friendly web interface helps users to quickly check and manage the 48-port managed switch. *Note 1: in stacking process, you need to pull and plug the console cable into each 48-port managed stackable switch repeatedly. By contrast, keep telnet cable connected with one switch is enough. *Note 2: the one being restarted firstly is the stack master. The S3900 48T4S 48-port stackable switch, born in this era where high speed network is badly needed, is an ideal Gigabit access switch for SMB, enterprise, and campus networks to boost productivity. And it is ideal for Internet Service Providers (ISPs) and Multiple System Operators (MSOs) to provide home users with triple-play services with up to Gigabit bandwidth. Posted in Network Switch	| Tagged chassis switches, stack cable, stackable switch	| Comments Off on Stackable Switch or Chassis Switch On the Network Edge?